PRYOR, JOHN, Baptist minister and educator; b. 4 July 1805 in Halifax, son of John Pryor and Sarah Stevens; elder brother of Henry Pryor; m. 9 Oct. 1826 Elizabeth Mary Boggs probably in Halifax, and they had four children; d. there 17 Aug. 1892. John Pryor’s father was a prosperous Halifax merchant and influential member of St Paul’s Church (Anglican). Business connections and family ties allied the Pryors with the political, social, and economic élite of Nova Scotia. John attended King’s College, Windsor, graduating ba in 1824 and ma in 1831. While there, however, he apparently came under evangelical influences that would dramatically alter his life. 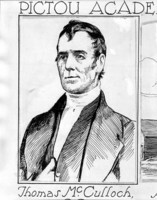 Forces within the Church of England in Nova Scotia, stirred by such men as the Reverend Hibbert Binney, tore St Paul’s asunder in the mid 1820s. The Pryor family sided with the evangelically minded curate, John Thomas Twining*, in a deep and acrimonious quarrel with Bishop John Inglis* over the appointment of Robert Willis* as rector. Finally defeated in 1825, the dissidents were forced to leave St Paul’s; some, including Pryor, James William Johnston*, John Ferguson, and Edmund Albern Crawley*, left the Anglican church completely. After some hesitation, they moved toward the Baptist denomination. However, the presence of these upper-class lawyers and businessmen in the essentially working-class, and primarily black, Baptist church led by the Reverend John Burton* caused serious strains and would ultimately be satisfactory to neither group. On 30 Sept. 1827 a separate congregation, known as Granville Street Baptist Church (now First Baptist), was formed by the dissidents. Two weeks later Pryor was baptized by immersion and joined the church. Within less than a month of his baptism he was appointed clerk of the church, and on 12 Sept. 1828 he was licensed to preach. Following his graduation from King’s in 1824, Pryor had taught school for some time in Sydney and Halifax. But shortly after he was licensed to preach, he abandoned this occupation to study for the ministry at Newton Theological Institute in Newton, Mass., and he was ordained in Providence, R.I., in 1830. He disliked what he called the “worldliness” of Americans. He was pleased, therefore, to return to Nova Scotia in 1830 to assume the principalship of Horton Academy in Wolfville, a school opened the previous year by the Nova Scotia Baptist Education Society. During the next eight years Pryor laid a solid foundation, both physically and academically, for the school; Horton Academy flourished until the mid 20th century. 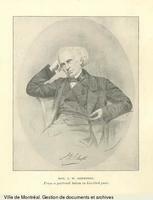 In 1838 Pryor supported E. A. Crawley in his bid for a professorship at the newly reconstituted Dalhousie College [see Thomas McCulloch*]. When Crawley was rejected that fall because he was a Baptist, Pryor shared his friend’s outrage. The two men met with the Reverend Ingraham Ebenezer Bill at Nictaux, and there determined to proceed with the original plan for Horton Academy and expand the facilities to include a college course. Their proposal was laid before the Nova Scotia Baptist Education Society at a meeting on 15 November, at which time the decision to found Queen’s College (renamed Acadia in 1841) was made. The first classes were held in January 1839, with Pryor and Crawley sharing the teaching and administration. The student population numbered 19. Pryor served Acadia for nearly twelve years, the last three as the college’s first president. He taught a wide variety of courses, travelled extensively – even to England – to raise money, and supervised the daily lives of the students. He was particularly concerned about their spiritual welfare, considering it his special duty to turn out educated, Christian young men. The successive revivals that swept the academy, college, and surrounding communities during his tenure did a great deal to calm the fears of many Baptists that education and religious enthusiasm were mutually exclusive. In 1848 the college conferred on him the honorary degree of doctor of divinity in recognition of his services. Apparently feeling a lack of support for Acadia, and for himself as president, within the denomination as a whole and tired by his exertions over the past 20 years, Pryor resigned in 1850. (He would return to the college briefly in 1862–63 as its first alumni professor.) He spent the 1850s as minister of the Baptist church in Cambridge, Mass., and in 1863 returned to his home church on Granville Street in Halifax. This last move turned out to be a disastrous one. Pryor became embroiled in a scandal that would permanently blacken his reputation. In 1867, after several years of rumours, members of his congregation accused him of embezzlement of trust funds and of impropriety with a woman of questionable character. His church was torn apart by the resulting controversy, and the entire denomination became involved. Although a council of ten ministers and laymen found him only “incompetent” in handling the funds and “indiscreet” in his personal relations, the church would not accept its recommendation to reinstate him, and his career in Halifax was finished. He returned to the United States where he served several churches until his retirement in 1881. Perhaps because of this scandal, Pryor has not received the credit due him for his role in the founding and development of Acadia University. In addition, he was overshadowed by the flashier, and louder, Crawley, who was determined to have whatever honours were forthcoming. His estrangement from Acadia, the loss of his money in the collapse of the West Columbia Mining and Manufacturing Company [see Crawley], the Granville Street scandal, and the deaths of three of his children made Pryor’s life a rather tragic one and obscured his very real contribution to education in Nova Scotia. John Pryor is the author of Letter to the Nova Scotia Central Baptist Association (Cambridge, Mass., 1868). A portrait of him hangs in University Hall, Acadia Univ. (Wolfville, N.S.). Acadia Univ. Arch., Associated Alumni of Acadia Univ., minutes of executive and annual meetings, 1859–1927; Board of Governors, minutes, 1850–83; West Columbia Mining and Manufacturing Company, letter-book, 1856–57. Atlantic Baptist Hist. Coll., Acadia Univ., Edward Manning, corr. and journals; Nova Scotia Baptist Education Soc., minutes and papers. PANS, MG 4, 41. Baptist Convention of the Maritime Provinces of Canada, Baptist year book (Halifax), 1892. I. E. Bill, Fifty years with the Baptist ministers and churches of the Maritime provinces of Canada (Saint John, N.B., 1880). “History of St. Paul’s Church, Halifax, Nova Scotia, no.iv,” ed. G. W. Hill, N.S. Hist. Soc., Coll., 3 (1882–83): 13–70. J. W. Johnston, Letter to the Granville Street Church, Halifax, N.S. (Halifax, 1867); Memorial addressed to the Central Baptist Association of Nova Scotia (Halifax, 1868). Nova Scotia Baptist Education Soc., Report (Halifax), 1833, 1835–37. J. Y. Payzant, Church government: a letter to Rev. E. M. Saunders, pastor of Granville Street Baptist Church, Halifax (Halifax, 1868). Reply of the Granville Street Baptist Church, Halifax, to the letter addressed to them by the Hon. J. W. Johnston, judge in equity (Halifax, 1868). Christian Messenger (Halifax), 1838, 1844–50, 1867–68. Christian Visitor (Saint John), 1867–68. W. E. Boggs, The genealogical record of the Boggs family, the descendants of Ezekiel Boggs (Halifax, 1916). DCB, vol. VIII. P. G. A. Allwood, “First Baptist Church, Halifax: its origin and early years” (m.div. thesis, Acadia Divinity College, Acadia Univ., 1978); “‘Joseph Howe is their Devil’; controversies among Regular Baptists in Halifax, 1827–1868,” Repent and believe: the Baptist experience in Maritime Canada, ed. B. M. Moody (Hantsport, N.S., 1980), 75–87. Eaton, Hist. of Kings County. E. D. King and J. G. Quigley, One hundred and fifty years of the First Baptist Church, Halifax, N.S. ([Halifax, 1977?]). G. E. Levy, The Baptists of the Maritime provinces, 1753–1946 (Saint John, 1946). R. S. Longley, Acadia University, 1838–1938 (Wolfville, 1939). B. [M.] Moody, “The founding of Acadia College: the Halifax connection” (paper delivered at the Atlantic Hist. Conference, Halifax, 1980). E. M. Saunders, History of the Baptists of the Maritime provinces (Halifax, 1902). Barry M. Moody, “PRYOR, JOHN,” in Dictionary of Canadian Biography, vol. 12, University of Toronto/Université Laval, 2003–, accessed April 24, 2019, http://www.biographi.ca/en/bio/pryor_john_12E.html.